Today's Maya date is: 13.0.6.7.13 - 2314 days into the new cycle! On his return to Mexico in 1546 Juan Cano wrote, on behalf of his wife, his first petition to Crown Prince Phillip (the future King Phillip II of Spain), “claiming lands and towns” for Doña Isabel and obtained the necessary çedula (order) from the Crown Prince to start a judicial investigation (AGI Patronato Real 245 R3:f2r). Around November 1548 Juan Cano presented in the Royal Audiencia of Mexico City - the supreme judicial and administrative body of the viceroyalty of New Spain - one more petition listing towns and lands held by Dona Isabel’s parents (AGI Patronato Real 245 R3:5v-6r). 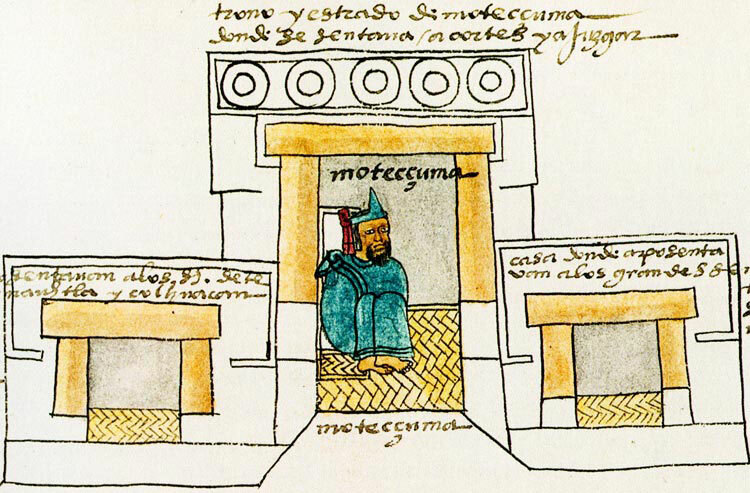 Approximately two months later, on January 4th 1548, it was followed by a new one, also addressed to the President of Royal Audiencia and containing 39 questions with a detailed description of lands, settlements and buildings belonging to Motecuhzoma Xocoyotzin and his principal wife, the daughter of Ahuítzotl and mother of Doña Isabel. Compared with the previous documents of 1532 the new list of disputed estates was more than impressive (AGI Patronato Real 245: R3: 5v-16v). If both the Relation Concerning the Genealogy and Lineage of the Lords, who have governed this Land of New Spain, and the Origin of Mexicans listed 15 towns in the basin of Mexico and surrounding areas as Motecuhzoma’s “patrimony”, in the questionnaire their number was increased to 117 towns and land plots within their limits (AGI Patronato Real 245: R3: 5v-12v; Garcia Icazbalceta J. 1941: 255, 277-278). The properties allegedly belonging to Motecuhzoma’s chief wife included lands in 39 towns as against only 10 mentioned in the documents of 1532 (AGI Patronato Real 245: R3: 12v-15r; Garcia Icazbalceta J. 1941:277-278). In the name of Doña Isabel Juan Cano also made claims to the land beneath the Viceroy’s residence and the Royal Audiencia of Mexico, built on the site of Motecuhzoma’s palace (AGI Patronato Real 245: R3:16r). Again, in his last petition to the President of the Royal Audiencia dated January 4th 1548 Juan Cano stressed that Doña Isabel was “the only and universal heiress, because there was no other daughter and today there is no other legitimate one or son... And the said estates about which I gave testimony to His Lordship and many others I didn’t mention... belong to the said Doña Isabel, my wife and your Lady [Italics mine–A.K.] (AGI, Patronato Real, R3:f.6r). The latter depiction of Doña Isabel as “your Lady” (vuestra señora in the original) as presented to Audiencia officials is especially curious. It may throw light on the self-perception of Doña Isabel as the only legitimate heiress of her ancestors’ power and dominions, who in other circumstances might have ruled Mexico. In this respect we disagree with the brilliant American historian Charles Gibson that the entire campaign for the inheritance of the Mexica lords was due exclusively to Juan Cano’s ambitions, and that Doña Isabel was merely a helpless pawn in his hands (Gibson Ch. 1964:425). It’s worth noting that in her will Doña Isabel refers to this campaign as her own initiative, and speaks openly of the enormous debt of the Spanish Crown to her father and to her. Moreover, if the case had a successful outcome she intended to give the entire inheritance to her daughters Isabel and Catalina, and gave instructions to this effect in her will. Unfortunately these wishes didn’t coincide with Castillian law, which gave preference to sons as heirs (AGI, Justicia 181, 1: ff.202r/v). By contrast it DOES fit the pre-Hispanic inheritance pattern among Mexica rulers, which regarded a ruler’s daughter, born of the principal wife, as transmitter of her father’s power and earthly possessions. It should be noted that by marrying Ahuitzotl’s daughter Motecuhzoma himself had in turn received the lands and settlements of his predecessor. From its start in 1546, the litigation surrounding the Mexica ruler’s inheritance, with its lengthy interrogations of witnesses, and several interruptions (probably caused by lack of funds on the plaintiff’s side), continued for 10 years without any tangible result. 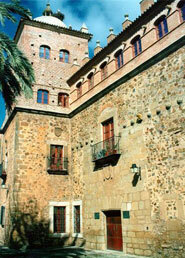 Doña Isabel died on July 11th 1550 not having seen the end of her lawsuit (López de Meneses: 1948:488). 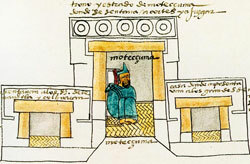 In October 1556 the Royal Audiencia of Mexico City finally confirmed the inheritance rights of Motecuhzoma’s daughter and her children to all the disputed lands and settlements. Nevertheless, this confirmation was only formal, for, as the judges acknowledged, all these estates were already held by other individuals, and to dispossess them would have caused great discontent. Thus they declared the restitution of these properties to be absolutely impossible (AGI, Patronato Real 181, R8:210v). However, the youngest son of Doña Isabel, Don Juan Cano de Moctezuma, was able in some sense to restore the family’s past grandeur. He left for Spain, to his father’s home city of Cáceres, where he launched an impressive career. 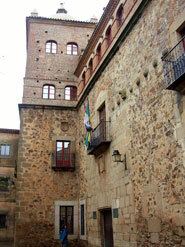 Juan Cano de Moctezuma not only obtained the final recognition of the Spanish Crown as legal heir to Motecuhzoma and his inheritance, but also married Doña Elvira de Toledo, who belonged to one of the most aristocratic families in Spain, and initiated the lineages of the Toledo Moctezumas, Carvajal and Vivero, which from the late seventeenth century bore the titles Counts of Enjarada and Dukes of Abrantes and Linares (Gibson Ch, 1964: 425). In Cáceres he constructed the vast building generally known as the Palace of Toledo Moctezuma. 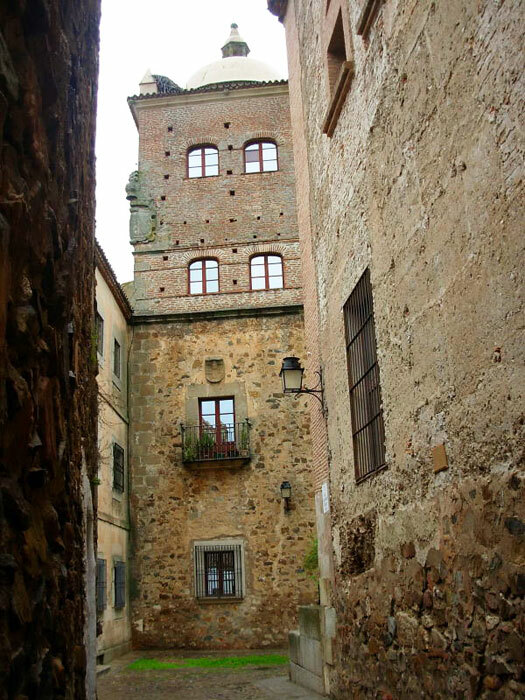 It has survived to the present day in spite of all the political and natural cataclysms that Spain suffered in the following four centuries. • Alvarado Tezozomoc, Hernando, 1975, Crónica Mexicayotl, Mexico: UNAM. • Chavero, Alfredo, 1953, Historia Antigua y de la Conquista en México a través de los Siglos vol.1, Mexico: Editorial Cumbre. • Chimalpahin, D.F. 2003 Diario: Las Ocho Relaciones y el Memorial de Colhuacan 3 vols, Mexico: CONACULTA. • 1980 Códice Aubin: Manuscrito Azteca de la Biblioteca Real de Berlin. Anales en Mexicano y Jeroglifos desde Salida de las Tribus de Aztlan hasta la Muerte de Cuauhtemoc, México: Editorial Inovación. • 1994 Códice Cozcatzin. 2 vols, Mexico: INAH. • 1992 Códice Techialoyan García Granados, Toluca: Gobierno del Estado de México, Secretaría de Finanzas y Planeación. • Corominas y Pascual Juan, 1954 Diccionario Crítico Etimológico de la Lengua Castellana 4 vols, Bern: Editorial Franke. • Díaz del Castillo Bernal, 1975 Historia Verdadera de la Conquista de la Nueva España. Barcelona: Editorial Ramón Sopena. • Gibson, Charles, 1964 The Aztecs under Spanish Rule. Stanford: Stanford University Press. • — Orígen de los Mexicanos, México: Chávez Hayhoe. Pp.281-308. • Ixtlilxochitl, Fernando de Alva, 1848 Historia Chichimeca in Antiquities of Mexico, ed. Kingsborough E.K. Vol. 9.205-316. London. • López de Meneses, Amada, 1948 Tecuichpochtzin, Hija de Moteczuma (1510?-1550) Revista de Indias (9):31-47. • Martínez, José L., ed. 1990-91 Documentos Cortesianos: Primera y Segunda Seccion. 3 vols Mexico: UNAM, Fondo de Cultura Económica. • Oviedo y Valdés, Gonzalo Fernández de, 1995, Diálogo del Alcaide de la Fortaleza de la Cuidad de Santo Domingo de la Isla Española Autor y Cronista de Estas Historias, de Una Parte e de la Otra, Un Caballero Vecino de la Gran Cuidad de México llamado Juan Cano in Sucesos y Diálogos de la Nueva España: prológo y selección Edmundo O’Gorman Mexico: UNAM P.117-128. • Pérez Rocha, Emma, Tena Rafael ed. 2000 La Nobleza Indígena del Centro de México Después de la Conquista. México: INAH. • Sahagún, Bernardino, 1950-82 Florentine Codex: General History of the Things of New Spain. Santa Fe: University Press of Utah. • Zavala, Silvio y colaboradores ed. 1939-42 Epistolario de la Nueva España 1505-1818. Recopilación por Paso y Troncoso Francisco, 16 vols México: Antigua Libreria Robredo de José Porrúa e Hijos. • Zorita, Alonso, 1891 Breve y Sumaria Relación sobre Señores de Nueva Espana in Nueva Colección de Documentos para la Historia de México publicados, por J. García Icazbalceta, México: Vol.3. Pp. 69-205. Sincerely I didn’t expect that my modest essay would provoke so vivid a reaction and even anger from some persons who identify themselves as descendants of Doña Isabel de Moctezuma par excellence, although just through maternal line. I checked periodically all the comments, and now I finally have enough time to answer them and to make some points clear. First of all I want to stress that I invented nothing, for the main task of a historian is to find, analyze and shed light on all the existing data about the person in question, not to write fiction. The only liberty granted to a historian when reconstructing the biography of a historical personage is the right to make assumptions and hypothesize, but always within the limits of existing evidence, comparing already ascertained facts and drawing conclusions based on them. All the rest belongs to fiction writers. 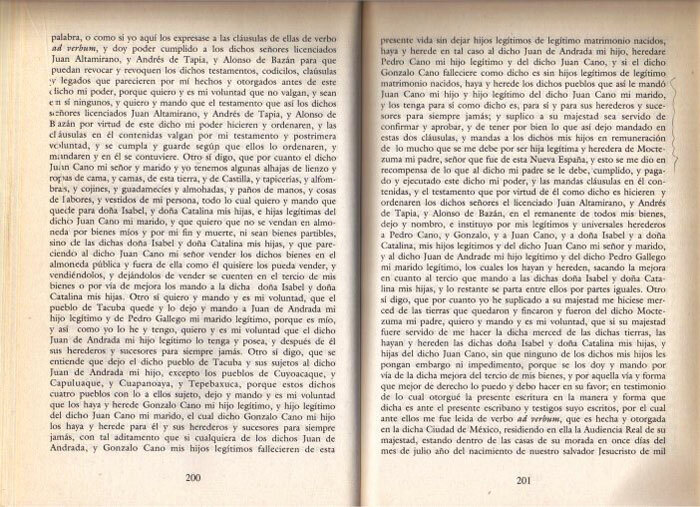 As for Tecuichpochtzin’s first marriage before the Conquest I dug out this evidence from Información de doña Isabel de Moctezuma in which it’s confirmed by the witness named Juan Ecutlatoa, who was one of the first witnesses summoned to present their declaration on January 8 1548 at the very beginning of the legal process. He was about 63 years in that time, therefore born ca.1485 (by the way in the same year that Hernan Cortés himself!) and as a mature man of 34-35 years he might have remembered very well the events just before the Spanish Conquest. The persons who are especially interested in this subject can consult the folios 71v and 72v. of the IIM copy from the section Real Patronato 181 R8 in the General Archive of the Indies. There they will find that Juan Ecuatlatoa actually refers to Atlixcatzin as “the first husband of the said doña Isabel” marido primero de la dicha doña Ysabel). Most of the AGI documentation is already available on-line through the website Pares. The truth is that I didn’t see any other mention of this marriage in contemporaneous colonial sources, but neither I saw any refutation of this fact. If you state that such source really exist, please, give its exact reference. Otherwise it can’t be taken seriously. As for the rearing of Mexica girls in rulers’ families one should read the respective pages in Memoriales by fray Toribio de Motolinia, one of the first 12 Franciscans who arrived in Mexico in 1523, or Primeros Memoriales the initial draft of Historia general de las cosas de la Nueva España by fray Bernardino de Sahagun, or the respective chapters in the Book VI “Rhetoric and Moral Philposophy”, or Bancroft Dialogues: The Art of Nahuatl Speech translated and published by leading Nahua scholars James Lockhart and Frances Kartunnen in 1987. The second thing I want to make clear: it wasn’t my intention to vilify or denigrate one of Motecuhzoma’s 10 daughters whom he sired in the course of his dramatic life. I love Mexico as if it were my own country and I consider my work as a sort of response to the kindness and hospitality of Mexican people. If didn’t find any solid evidence to portray Doña Isabel as “national heroine” and the ethical antithesis of Malinche, it’s just objective reality as far as it can be reconstructed on the basis of historical evidence. I even spared my readers and didn’t include in my report the unflattering characteristic of Doña Isabel given by Don Antonio Cortés Totoquhuaztli who in his letter to the emperor Charles V bitterly complained: First of all we affirm that there is no other town that is so seriously affected by excessive tributes as ours, which by the date has been oppressed by our encomendero Juan Cano and not only by him but also by the daughter of Monteçoma, who was his wife; the aforementioned although being of our blood and our homeland, showed herself, however, so alien to humanity, that instead of charity and natural love which people of the same land and nation feel to each other, exercised tyranny and treated us born from revered and noble fathers as her servants.” This document written on December 1 1552 is published and you can find it in the book La nobleza indígena del centro de México después de la Conquista Mexico:INAH 2000 p.167-178. I found a web page that claims that the Moctezuma family received reparations. Have you seen collaboration to this?